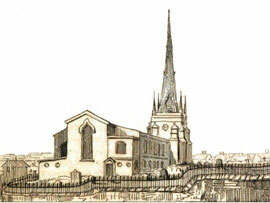 This website is organised by the ancient parishes which are now within the City of Birmingham (plus some adjoining). Daughter churches in each ancient parish are then listed in order of their date of foundation. There is a separate section for churches within the Diocese of Birmingham, but outside the City of Birmingham. Churches built after 1800 - http://www.british-history.ac.uk/report.aspx?compid=22976. See also Church Plans Online - http://www.churchplansonline.org/ - this site appears to be no longer working. Unless otherwise stated, all the photographs on this website are my own and are reusable under Creative Commons Licence: Attribution-Non-Commercial 2.0 UK: England & Wales ie. You can use them non-commercially as long as you acknowledge their source - William Dargue 'A History of Birmingham Churches . . . from A to Y' - http://ahistoryofbirminghamchurches.jimdo.com/. The source of any out-of-copyright images is always given where possible. The source and copyright restrictions of any other images is given alongside them in the text. About This Site - Contact.